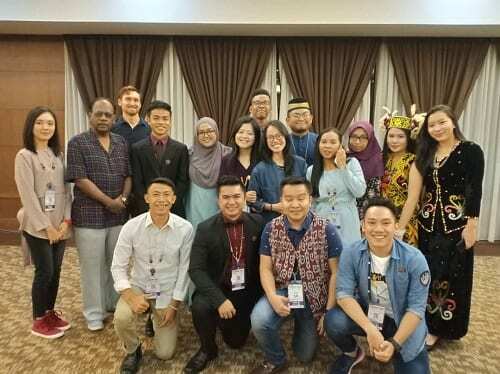 Nineteen Young Happiness Ambassadors from Malaysia joined some 150 delegates from 12 countries at the 8th International Conference on Gross National Happiness (GNH) from 14-16 November hosted by Universiti Teknologi MARA (UiTM) in Shah Alam. 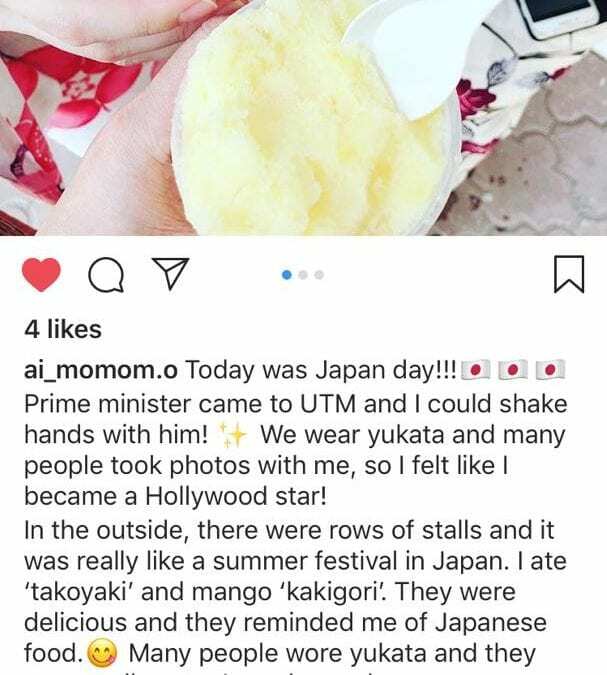 UTM team, led by Dr Akbariah Mohd Mahdzir, was represented by Anis Fahizha binti Fahim (MJIIT), Lee Ern Tung (Razak Faculty) and Mac Foster Sulai Anak Langkau (MJIIT). The idea of forming a network of Young Happiness Ambassadors is to share the young people perspectives, experiences, actions and solutions in the GNH discourse. Besides contributing to the GNH discourse, the Young Happiness Ambassadors would advocate or promote GNH in schools, universities, colleges and youth organisations in order to mobilise a youth movement that champions the four pillars of GNH. The formation of the YHA network and the establishment of YHA Charter are some of the outstanding outcomes of the GNH conference. KUALA LUMPUR, 25 Oct. – Kudos to our researchers ! Seven Universiti Teknologi Malaysia (UTM) researchers from various expertise and field of research received awards in multiple categories in the Malaysia Research Star Award, here, today. The Deputy Vice Chancellor (Research & Innovation), Prof. Datuk Dr. Ahmad Fauzi Ismail received the International Research Collaboration award alongside with Prof Ir Dr Nor Aishah Saidina Amin from School of Chemical and Energy Engineering (SKT) and Assoc. Prof. Dr. Sharidan bin Shafie from Faculty of Science. Prof Dr Zainal Salam from School of Electrical Engineering (SKE) was selected as the Frontier Researcher, and Dr Tan Chee Wei, also from SKE was awarded in the High Impact Paper category. Meanwhile Prof Ir Dr Sharifah Rafidah binti Wan Alwi from SKT and Assoc Prof Dr Nor Azwadi bin Che Sidik from Malaysia-Japan International Institute of Technology (MJIIT) were the winners for Young Researchers. The Malaysia Research Star Awards were held at the Sama Sama Hotel in Kuala Lumpur on 25th October 2018, and was graced by the Ministry of Education (MoE) Secretary General, Dato’ Dr. Mohd Gazali Abas. The awards also recognised Malaysia’s most promising and influential researchers, and the winners were chosen based on a combination of research metrics from Elsevier’s Scopus and qualitative factors. The award recipients span a variety of research disciplines such as engineering, agricultural sciences, materials science, chemistry, social sciences and environment/ecology. For the 2018 Malaysia Research Star Awards, Elsevier has worked closely with MOE to recognize a total of 18 researchers in 4 award categories. With intensifying urbanization and industrial revolution moving at rapid speed, our environment is constantly exposed to untreated wastewater discharged from various sources. Increasing demand for palm oil has raised concerns about the environmental impacts of wastewater streams. The levels of pollution generated from the palm oil industry have been escalating following its rapid expansion in Malaysia. Without adequate treatment, surface water pollution becomes an issue where there is either insufficient or improper disposal of solid and liquid wastes into receiving rivers or lakes. Despite the continuous expansion of wastewater treatment technologies, researchers are still finding it challenging to maintain the efficiency of the existing methods, many of which are relying on conventional activated sludge model. Dr. Norhayati’s research focuses on aerobic granular sludge, which are seeds made of special microorganisms. These microorganisms break down the organic compounds in wastewater into much simpler compounds, allowing the treated wastewater to be released safely into receiving water bodies. Aside from the positive ramifications on the environment, her method is a cost-effective treatment reducing operational and maintenance costs. It is no surprise that Dr. Norhayati chose wastewater treatment as her research subject. Since 2002, she’s been actively involved in the International Water Association (IWA), networking and meeting water and wastewater experts from around the world as Board of Director and Fellow. “I was motivated by IWA’s notion to inspiring change together and contribute more to the sector. In fact, IWA has been instrumental in shaping my water career until today,” she says. She has been an active IWA member since her student days back in 2002. Dr Norhayati was instrumental in the development and regional implementation of IWA Young Water Professional program of activities that aim to empower young professionals and develop the global awareness around water needs in term of skills and actions. She is the recipient of the prestigious IWA Young Water Professional Award 2012 in Busan, Korea. Her commitment has been recognised by her election as the Chair of the IWA Young Water Professional Steering Committee and then being nominated by the general assembly of the IWA to be a member of the Board of Director of the International Water Association (IWA). “I was actually interested in philosophy, positive psychology and human behavior when I was starting out as a student. I never made it to any of the degree programmes for them though. However, the combination of interest in environmental psychology and engineering helps me to better communicate science to society,” shares Dr. Norhayati. Dr. Norhayati went on to excel in her environmental sciences courses, so much so she eventually became a senior lecturer for Environmental Engineering and completed her Masters project on anaerobic treatment for wastewater containing antibiotics. 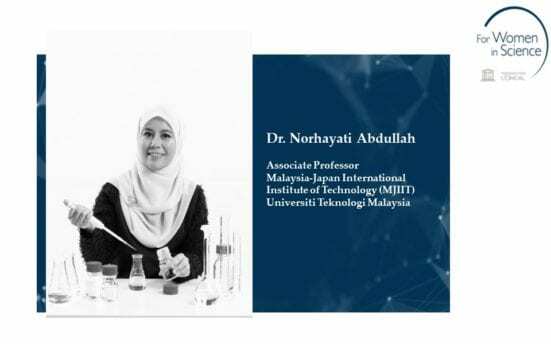 Having a supportive husband, Assoc Professor Dr Ali Yuzir who is a former fellow academia at the Faculty of Civil Engineering, allowed Dr Norhayati to pursue her PhD. “He shared the responsibilities of taking charge of our young boys during the busy years and most importantly, for letting me explore science wherever and whenever I wanted,” says Dr. Norhayati. 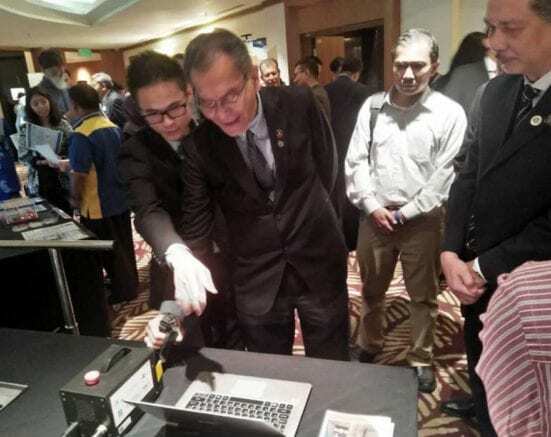 Her collaborative work between Universiti Teknologi Malaysia (UTM) and Newcastle University, UK was presented at the House of Commons in London, during the eminent SET for Britain Engineering Exhibition in 2011. In 2017, Dr Norhayati spent four months at the University of Michigan, Ann Arbor USA for her US-ASEAN Fulbright Visiting Scholar Initiative. Her scholarly and professional research experiences in the United States focuses on Malaysia and ASEAN issues on traversing responsible technologies for methane strategy. Dr Norhayati was elected among the Top 50 Most Impactful Leaders in Water & Water Management (A Global Listing) in February 2018. “It is exhilarating to uphold such a prestigious research brand and position endorsed by both L’Oréal and UNESCO at national and international levels,” says Dr. Norhayati. UTM is honored to see Dr. Norhayati as the winner of the L’Oreál-UNESCO For Women in Science Fellowship 2018 as this would give encouragement to many of our members, fighting for developing awareness, actions and results on the sustainable water challenges. JOHOR BAHRU, 8 Oct. – The electrical engineering Doctor of Philosophy (PhD) graduate of Universiti Teknologi Malaysia (UTM), Dr. Khor Kha Xiang was chosen to represent Malaysia in Young Innovators Program at the World Innovation Summit for Health (WISH) 2018 at Doha, Qatar. The programme which is to be held at Doha, Qatar on this coming 13-14 November 2018 is an annual programme which highlights some of the most exciting innovations in healthcare through its Young Innovators competition. Dr. Khor Kha Xiang graduated from Malaysia-Japan International Institute of Technology (MJIIT), UTM and his PhD project titled “Portable and Reconfigurable Robot for Forearm Rehabilitation and Assessment of Post-stroke Subjects” or CR-2 Haptic. This project has yielded over 10 publications including in Q1-ranked journals throughout his PhD studies. He is also the co-founder and Chief Executive Officer (CEO) of Techcare Innovation Sdn. Bhd. that develops smart rehabilitation and fitness devices. His supervisor, Dr. Yeong Che Fai said the project of “CR2-Haptic” was developed with the aims to motivate and train the hand movement of stroke survivor with virtual reality and robotics technology. “CR2-Haptic is a portable and reconfigurable rehabilitation robot for forearm rehabilitation training. Reconfigurable rehabilitation robot’s advantage is able to increase the functionality of robot therapy by adopting different therapeutic devices for different training movements and patients’ recovery. “CR2-Haptic design incorporates various passive modules using one single robot to train multiple hand components,” said Dr. Yeong. The CR2-Haptic consists of patient-tailored robot-assisted training therapy that is able to provide customizable training including passive, active-assisted and resistive modes to cater for different recovery stage of subject. Dr. Yeong said that the user of CR2-Haptic can perform assessment and multiple repetitive wrist, forearm and hand training while engaging with virtual reality games. “Each year, WISH highlights some of the most exciting innovations in healthcare through its Young Innovators competition which provides a platform for tomorrow’s most promising healthcare leaders. “Their innovations include devices, applications, innovative delivery models and design-based solutions that improve quality of care and patient experience, while also reducing the cost of care,” said Dr. Yeong. Around 2000 healthcare experts, innovators, entrepreneurs, policymakers, and ministers from over 100 countries will gather in Doha, Qatar on this coming November as one community to collaboratively work to achieve one goal, a healthier world.